Joe Licata (BA ’15) made a statement by staying close to home. UB football fans know him as the guy in the helmet throwing touchdown passes. Most don’t know that this record-setting passer is just as comfortable sporting a fedora and singing along to Frank Sinatra. “When people look back, I want them to see a team that fought hard and had a lot of pride in the name on their chest, and someone who had fun out there playing for the city, his family and friends,” Licata said. Licata didn't get drafted by an NFL team this past April, but the Cincinnati Bengals signed him after a work out in May. Read some coverage of his journey to the pros below. 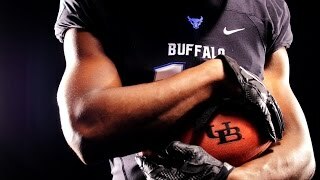 UB Football unveils new uniforms. The new Nike-designed uniforms feature blue, black and white jerseys and white and black pants. All three jerseys will have Buffalo inscribed above the numbers across the chest.